Safeway's new The Market store opened today. 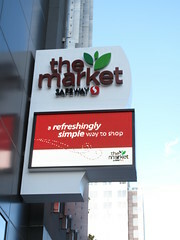 One of the most anticpated events of this summer has finally come to downtown, as Safeway opened its new “The Market” store downtown. The new store is in The 88 apartment tower, at 2nd and San Fernando. The store is a little bit of a different concept for Safeway, a smaller store focusing on “grab and go” foods and prepared foods like deli sandwiches. In addition to ready-to-eat food, there was a good selection of produce, including organics, and also packaged and frozen food. Visiting this morning, I didn’t notice that there was any meat counter at all, though I only stopped in quickly on my way to work, and I could have missed it. Prices were similar to other Safeway stores, and a manager from Safeway’s district office told me they intend to keep it that way. Safeway managers were all over the store and seemed to be enthusiastic about developing a new kind of store for Safeway. I was told if the concept works out they have several other locations picked out where they might put similar stores. I was also told that Safeway is committed to stay in downtown for the long haul, and they have a long lease on the store location. 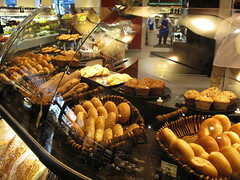 Bakery counter at the new downtown Safeway. The new store is clean (naturally) and perhaps “cozy” but not cramped. The fruit and vegetable selection and the competitive prices will be a big gain for people living downtown. Fans of Zanotto’s Market are of course concerned about Safeway stepping in to their “territory” after Zanotto’s took a big risk to bring groceries to downtown when nobody else was willing to do it. I can also imagine the new store threatening Su Vianda, which has done a great job maintaining a clean, spacious store with fresh products in a space that had none of those features under the previous operator (Lucky/Albertson’s). I hope all three of these groceries can find their niches, because competition will keep them all motivated to provide better service and prices. Tonight is council member Pierluigi Oliverio’s 3rd annual district 6 “Safety Fair & Outdoor Movie Event“. Got a simple question for a librarian? As of this month, you can text your question to a San José Public Library librarian at short code 66746; be sure to start your message with “AskSJ” (without the quotes). You can send your question anytime, but questions are actually answered Monday through Friday between 1 and 6 p.m.
Nielsen Mobile statistics quoted in the library’s press release state that U.S. teens “sent and received an average of 1,742 text messages per month in Q2 2008.” The library has tapped into that trend with this great new service. This service is absolutely free. Those averse to texting can always access other options for getting answers to questions on the library’s Ask a Librarian page. Options include email, chat, and telephone help, as well as traditional in-person assistance. Zombies To Take Over Downtown Tomorrow! The walking dead take over downtown tomorrow night for the Zombie-O-Rama and if you’ve ever wanted to zombify yourself and roam the streets – this is your chance to do it! 6pm: Zombies then make their way to Gore Park (the corner of First and Williams) where maps will be handed out. The map will have a list of the pub-crawl for various places offering happy hour specials or free gifts. 7:45pm: After the zombies make their way through the downtown spots, head back to Gore Park for an outdoor showing of Shaun of the Dead (2004/ Rated R/ 99 minutes) courtesy of Starlight Cinemas. Caffe Trieste – During Happy Hour (4-7) 2-1 Peroni. The Blue Chip (this is downstairs at 325 S. First Street, so you might miss it) $1 Tecate and $3.00 Well Drinks. Free Fries with cheese steaks. Posted in Downtown, Events, Film, Free, Fun, San Jose | Comments Off on Zombies To Take Over Downtown Tomorrow! A free music series at San Jose State University begins this weekend, continues Tuesday, and winds up next weekend, between August 22 and 30. What kind of music you ask? John Williams film scores, Lemony Snicket music, a legendary jazz vocalist, Beatles music a brass band, and more performed by Symphony Silicon Valley along with other artist. The concerts, bottled water, harmonicas for children at the Family Concert and ice cream at the Brass Band Concert, are all free. Maestro Bruce Hangen and the orchestra’s performance may include Jurassic Park, ET, Star Wars, Jaws, Schindler’s List, Indiana Jones, and Harry Potter. A family concert, with Lemony Snicket music The Composer Is Dead and harmonica virtuoso Robert Bonfiglio playing Gershwin. The first 1,200 kids receive a free harmonica. A Beatles tribute band from the Broadway show “Beatlemania” joins the orchestra to perform classics from the Lennon-McCartney Songbook, strings and horns! Classical Mystery Tour conductor Martin Herman along with soloists Jim Owen,Tony Kishman, Chris Camilleri, and Tom Teeley. The 39-piece band led by Tony Clements, principal tubaist with Symphony Silicon Valley perform Bugler’s Holiday, Thoughts of Love, Holst’s Mars, and selections from Phantom of the Opera. The ice cream is free. 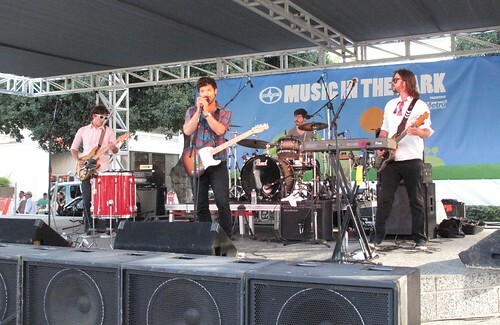 The concerts held on the grassy mall at San Jose State University; enter at 4th Street and West San Carlos. Bring a picnic and your beach chair. Arrive early! 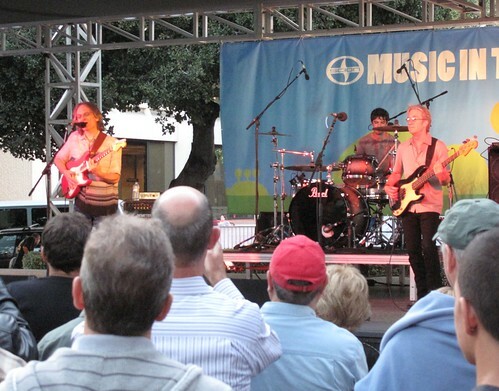 The year’s penultimate Music in the Park Thursday evening concert featured Sonny Landreth, the “King of Slydeco”. Which turns out ot mean ripping Satriani-style slide guitar played to a blues drumbeat. The opening act was San Francisco-based Music for Animals, playing a kind of 80’s-90’s electropop, reminiscent of Pet Shop Boys. A very mellow scene, since the crowds weren’t overflowing the park like they do sometimes, and a lot of fun. Outdoors showing of two films this Friday and Saturday, free! This Friday August 21, 2009 is Jackie Chan’s The Legend of Drunken Master. In this sequel to Drunken Master, Wong Fei-Hung (Chan) must do battle with thieves trying to smuggle priceless artifacts out of China. The film includes some of Jackie Chan’s finest choreographed fight scenes along with a knock your socks off final. Anita Mui provides a great comedic performance. Rated R – For adult content, adult language and violence. The film will be shown in the parking lot next to Orchard Valley Coffee, Downtown Campbell. The parking lot opens at 6:30 pm, the film begins between 8:00 pm and 9:00 pm; bring a chair and a blanket. Then on Saturday August 22, 2009, it is San Jose Giant’s Movie Nights with the showing of Bolt on the big screen. Bolt is an animated family film about the adventures of a canine actor, who believes that he really possesses superpowers, mistakenly shipped from Hollywood to New York City and now making his way back home. Along the way, Bolt befriends an alley cat and hamster providing insight about being a real dog in the real world. Voices include John Travolta (Bolt), Miley Cyrus (Penny) and Malcolm McDowell (Dr. Calico). Rated PG – For some mild action and peril. The film will be shown at Municipal Stadium, San Jose. Gates open at 6:00 pm and the film begins at 7:00 pm (showing on the big screen thus no need to wait for dusk). Check out the Family Fun Zone including speed pitch, bounce house and t-ball. Bring a blanket and watch the movie from the outfield. Admission and parking are free; concessions will be open during the movie.